A large manufacturer of automotive components was designing a lift table for in-house production. The servo motor being used needed a 10:1 gear ratio to reach the torque required to drive two shafts that connected to a chain actuator system. The engineer needed the shafts to rotate in opposite directions and also needed overload protection in case the table crashed. 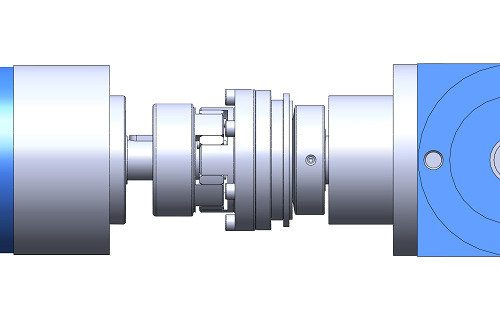 The main challenge was finding a 10:1 ratio gearbox to have dual output shafts rotating opposite of each other. 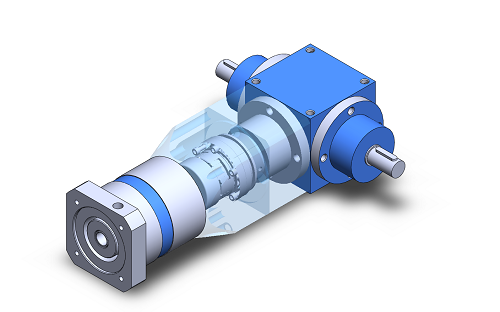 Typically, gearboxes with dual output shafts rotate in the same direction as they share the same output gear and the shaft runs the entire length of the output. GAM application engineers selected the V-Series spiral bevel gearbox model F0 which has dual output shafts that rotate in opposite directions because each output shaft has a dedicated shaft and gear. 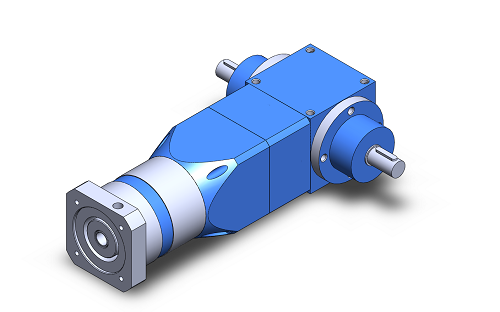 However, because spiral bevel gears are not offered in a 10:1 ratio, GAM selected a 1:1 ratio and then added a 10:1 planetary gearbox on the input to achieve the desired overall ratio. To provide overload protection, a SKB-EK safety coupling was integrated between the planetary stage and the spiral bevel stage. Traditionally, a safety coupling would be mounted on both output shafts; however GAM was able to machine an adapter that enclosed the safety coupling between gear stages, and thus reducing the number of safety couplings required. This assembly is a great example of how GAM utilized standard products and configured them to meet the customer’s requirements.